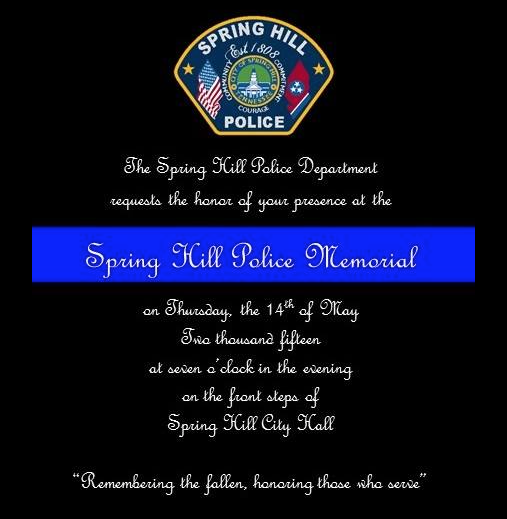 Spring Hill Police Department on Thursday, May 14, will host a Memorial Service at 7 p.m. in front of Spring Hill City Hall. The event Is free and open to the public and will be part of National Police Week, which runs from May 10-16, to commemorate the lives of fallen officers. The community is invited to show their appreciation and pay respects to the fallen officers and their families. In 2013, 156 officers were killed in the line of duty, and 117 in 2014, all of whom had their names added to the walls of the National Law Enforcement Officers Memorial in Washington, D.C. Three were from Tennessee. Spring Hill officer Jeremy McLaren died from injuries he sustained in a car wreck in 2010. There is a memorial stone for officer McLaren outside of City Hall. For more information, call SHPD at (931) 486-2252.